On the whole, the recipe is pretty forgiving as long as you use the Philadelphia brand original cream cheese. If you want your cheesecake to be a little less sweat then substitute sour cream for heavy whipping cream. Since cherries are in season right now, I used fresh cherries and pitted them myself, but you could also use frozen cherries instead. The jars are Ball Regular Mouth 8 oz. Jam Jars, but there is nothing special about them. Put the pitted cherries in a sauce pan over medium heat. When the cherries begin to release their liquid add the sugar, stir to combine, and turn the heat up and bring to a boil. Let the cherries simmer for a few minutes until they seem tender enough. Add the cornstarch a little at a time, stirring constantly until the liquid has thickened to a consistency suitable for the topping. Put the cream cheese in your mixer's mixing bowl and beat until it has softened a bit. Add the vanilla, sugar, and heavy cream. When the ingredients are fully combined, add about half the egg mixture. When fully combined add the remainder of the egg mixture. Turn the mixer up and mix the filling until it has a smooth consistency. Fill the jars to the bottom of the threads. place a lid on each jar. lightly screw the rings down. You want air to be able to escape. The main reason for the lids and rings is so that you do not inadvertently splash water into the filling, and to give you something to easy gram onto when it's time to remove the jars from the water bath. When the water bath has come up to temperature put the jars into it. Let them cook for 90 minutes. At the end of that time remove the jars from the water path and let them cool on the counter for a few minutes, then place them in the refrigerator until completely chilled. Remove the ring and lid from each jar. 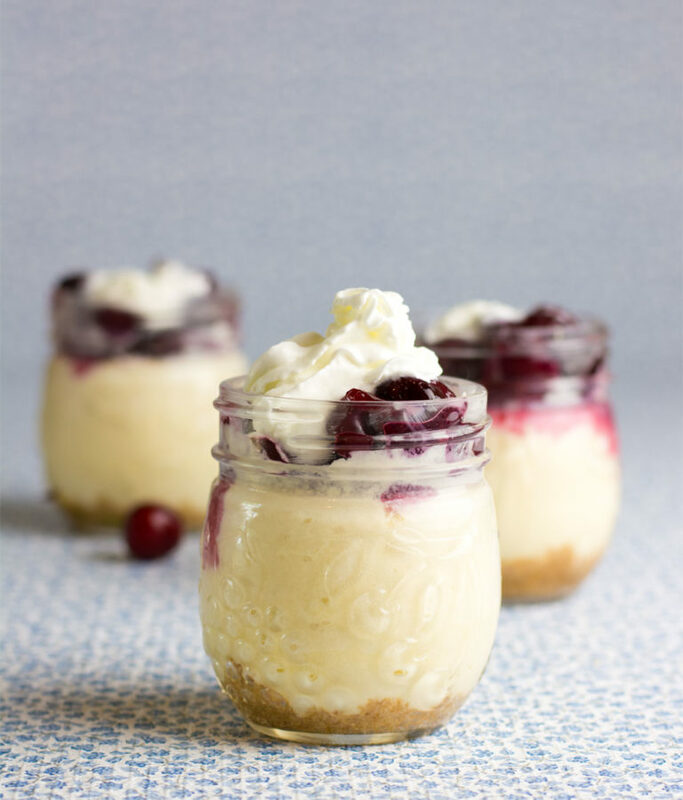 Spoon some cherries on top of the cheesecake.